Greektoys Children’s Revolution® is an educational project that aims to promote ancient Greek heritage through technology. Greektoys core team consists of Sofia Pavlaki and Luis Santos who love to introduce children to ancient civilizations. How do we achieve this? By using the ancient Greek toys as a “bridge” to make the connection from our days to the past days. Our idea was conceived in 2012, and since then the project is being implemented in Greece, Belgium and other European countries. Some of our core activities are creating an animated series for children (“Greektoys”) with characters based on ancient toys, researching ancient Greek toys and games, developing a 3D-virtual museum of ancient Greek toys, and creating a 3D-model of the Kasta Tomb of Amphipolis. On top of these activities, we are organizing workshops for children in Brussels and other European capital cities, in order to achieve our goal. Frequently we are invited by schools and universities to present our work, our techniques and the technology we use. Our work is supported by museums and archaeologists, who grant us access to original artifacts and provide us with scientific documentation from an archaeological point of view. Sofia has studied Information Technology and holds her Masters in Advanced Information Systems, and Luis has studied History of Art with a background in Classical Antiquity and he is a visual artist. We took our first steps in the 3D-world as animators. At the very beginning of this journey, in 2009, we started to create short animation films with Autodesk Maya and 3D sculpting with Mudbox. Later on we discovered Blender, during studies for the M.Sc. at the University of Piraeus, Greece, “Advanced Informatics and Computing Systems – Software Development and Αrtificial Intelligence”, in the course “Development of Virtual Reality Games and Applications”. Blender is an open source software and its great potential immediately caught our attention and interest. The opportunities that 3D design, modeling, scanning and printing can give at the service of preserving and promoting cultural heritage are fascinating. In 2012, we developed the idea of creating an animated series for children. The inspiration came from the ancient Greek civilization. The animated characters of this series were based on ancient Greek toys; Valios is a little clay horse, Lily is a rattle, and Filon is a pig-shaped feeding bottle. During the series production, we identified that the value of museum artifacts such as toys, or objects from daily life, is not widely recognized by the public, in comparison to the great achievements of the art and architecture of classical antiquity. However, we considered that these common objects do carry a kind of magic, as they can help us today to visualize and understand the daily life of that era, they help us to come closer and connect in a way with the people of past. We visit and work with museums in Greece and other European countries to document and digitize exhibits. 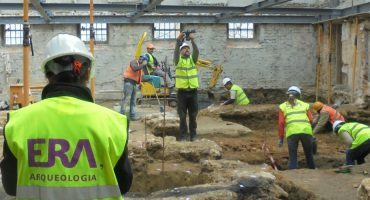 Archaeologists and museums are supporting our project by consulting us and giving access to the ancient exhibits. In Blender’s community we learned about Sketchfab and the great potential for sharing 3D-models in a 3D-viewer. That was the starting point to introduce us to photogrammetry. In 2014, our model of Kasta’s Tomb at Amphipolis was in the media spotlight, due to the fact that the excavation works were in progress revealing great findings and our model was updated with every new finding. This 3D-model was presented in the documentary Art Detective on Rai Storia channel (“The Mystery of Griffins”) and it was published in the “Historia National Geographic” and in the book “Ancient Greek Civilization”, Wiley Blackwell publications. Our next step was to experiment with the structure from motion photogrammetry. At first, we tried different mobile applications for smartphones, but gradually we turned to use SfM photogrammetry professional programs. Internet tutorials can be a great source of learning how to practice SfM photogrammetry and we used them a lot. At the same time, we followed online seminars, such as the e-learning course of University of Burgos, Spain. Our current project is to create a virtual museum of ancient Greek toys. Our ambition is to collect the greatest ancient toys exhibits from different museums’ collections from all over the world and to reconstruct them in their initial forms and colors. It is our belief that technology can be used efficiently and effectively to preserve and promote the cultural heritage of ancient Greek toys. Imagine that it is practically impossible for one person to see all different types of ancient toys just in one museum, given that the exhibits are spread in different museums around the world. Therefore, with the techniques of 3D scanning and modeling, we are presenting the emblematic samples of original ancient Greek toys and make them available in one single virtual environment, accessible to all audiences for all purposes of use from a plain observation to deeper study. A very direct use of these 3D-models is during our workshops in schools. We use screens, projectors, and audiovisual means to present the objects to children, explain where the objects were found, their material, shape, age, use, and provide archaeological information on these objects. Trying to combine the traditional ways of teaching together with modern techniques and technology, our aim is to gain the interest of children and turn the process of learning to entertainment. Of course, 3D technology cannot substitute a visit or a guided tour in a museum, but certainly it can act as a supplementary source of knowledge, giving children the opportunity to interact more with the objects (to check the little details that cannot be seen behind the glass of a vitrine, to zoom in and out, to rotate the object etc). Additionally, the 3D printed objects give the joy of playing with the replicated ancient toys. We create 3D objects mainly with the use of photogrammetry; an appropriate and useful technique for small delicate objects, such as toys, as well as 3D modeling for the reconstruction and completion of missing parts of a toy. The equipment we use is a Canon 1100D 18-megapixel photo camera, 50mm and 18-55mm lenses, tripod, 2-3 sources of softbox lights, white background and a rotating platform. If the object is located in another country and we need to travel then we use a portable box studio with 2 small sources of light. Agisoft Photoscan, PPT (Python Photogrammetry Toolbox), Meshlab, Blender and Instant Mesh are the main software programs that we use. Every photogrammetry project has its own challenges. Every object has its own particularities and uniqueness, such as, size, stability, color, type of surface, etc. Each one of these characteristics demands a different solution. As we are gaining experience, we have developed different strategies for solutions, but certainly every new object is a new challenge. One of the most difficult objects to scan are red-figure vases due to their glossy surfaces. However, 3D scanning with photogrammetry is still feasible and it can give impressive results. There is not a unique methodology, tips or tricks here; what it takes to have a successful result is multiple attempts and creativity. An essential factor for success in scanning glossy objects is the light. The challenge is how to place the lights in such a way that they will not be reflected on the object’s surface. Large softbox lights, an adequate distance from the object can help to create a unified surface with reduced shining. 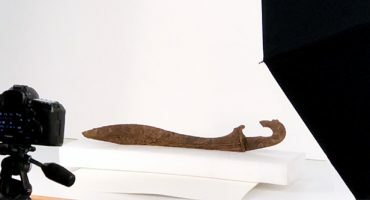 We consider the scanning of three ancient choes in the Museum of Art and History of Brussels, as a characteristic example of successful scanning. Choes are small terracotta wine vessels which were given as gifts to children during the Anthesteria (Athenian festival in honor of Dionysus, 5th century BC). To scan these three small glossy objects we used a box photo studio with three large sources of softbox lights, white background, a fixed-position camera with polarizing filter placed in front of the lens to manage reflections, and a rotating platform with special marked spots as a reference for post-processing by the photogrammetry software. To create one single object, we took 240 pictures, then we proceeded with photos alignment, next step was to create a dense cloud of points, then to create the mesh and texture in high definition. The final result was processed in Blender, where we added normal map and lights. In the following video, we can see a short description of the full process. For someone who is interested to enter the world of 3D scanning, we would advise to start with a basic kit of a digital camera or a smart-phone and a tripod. What is the most important, further than the equipment, is to practice. Experiment with different objects to gain experience. It is our common practice, that before we execute a scanning session with real objects in the museum, we experiment with similar objects at home. The results of these experiments will guide us to choose the best scanning strategy for the specific objects and help us to scan quickly and efficiently. Starting directly with the actual object without having an idea of how to proceed and tackle any difficulties of the specific object could cost a lot of time and effort. As a final point, we would advise searching internet for training material which can give a great introduction to someone’s first steps in 3D scanning. For professional projects, we would advise attending training photogrammetry seminars. 3D technologies, including 3D scanning, offer a new and unique way to contribute to protection and promotion of world cultural heritage. Therefore, the way that heritage organizations work will have to follow the direction that 3D technologies indicate. 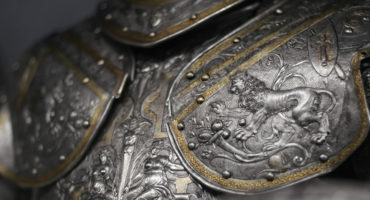 It is already a common practice among cultural organizations to proceed with digitization of their collections, since they have realized the great potential of 3D technology. Destruction of monuments and art works due to war and natural phenomena (e.g., Palmyra and the National Museum of Brazil), is a problem that heritage organizations should spend thought and effort on solving. Our proposal is that 3D technology is one of these ways. 3D documentation allows preservation of specific elements of the cultural objects, even if the original ones will be destroyed or lost. Hence, a significant digital heritage is being created, which also requires preservation and protection, in order to be given to the next generations. Heritage organizations ought to work towards the creation of international, possibly open, standard which will provide accessibility to the next generations. From our perspective, the added value of our project is to create “backups of culture heritage”. What else could be our favourite piece on Sketchfab other than a game? We really love the chess pieces of Lewis Chess Set of the British Museum. They are beautifully designed and scanned and their story is amazing. Additionally, we find that the sound description which is added in the model gives it an extra touch to make it more appealing. very nice article. just one question, what the hell is adobe maya? We updated the article, thanks for flagging this!